Join NIU Clarinet faculty member Gregory Barrett and guest artists for a full day of concerts, master classes and rehearsals. Clarinet Cornucopia is a festival for clarinetists who enjoy playing and learning about their favorite instrument and its extended world. Founded in 2002, Clarinet Cornucopia focuses on a different theme each year. 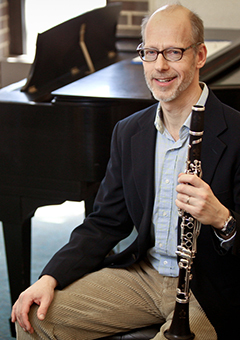 A featured performer gives a recital, teaches a masterclass and shares their perspectives on the clarinet and music. Attendees are invited to perform in a master class, medley recital and the ensemble concert including the Cornucopia Choir. Watch for announcements for the 2020 Clarinet Cornucopia. Thank you for attending the 2019 Clarinet Cornucopia "William Helmers and the Clarinet Works of James Grant."